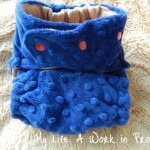 Roxie Harlow diapers are the creations of a SAHM/Etsy Shop Owner/Photographer/Navy wife. Since my hubby’s in the Navy, I received an adorable one-size pocket diaper with U.S. Navy-appropriate embroidery on the bum to review. 🙂 View available embroidery designs here. Note: I was informed that this particular embroidery design would look best on a cotton or linen fabric, rather than minky, but I still think the anchor looks adorable! The outer layer of this diaper is made with 100% polyester minky fabric. Minky is very soft and silky! Since it’s a one-size, this diaper fits approximately 10-35 lbs. The rise and waist size can be adjusted by using the rows of snaps. The inner layer is made with micro-chamois, a micro-fleece fabric that is also soft and silky. Micro-chamois is a “stay-dry” fabric, so it will help keep moisture off baby skin. As you can see, the micro-chamois is a sort of beige or light brown color instead of the typical white. I really like this, because it will make any staining less visible. The narrowest point in the crotch is about 6″ wide. As a comparison, BumGenius pocket diapers are about 6.5″ wide at their narrowest point. This is a good, solid, well-constructed pocket diaper. It did not come with an insert, but I was able to use it with both microfiber inserts and cotton prefolds stuffed in the pocket. The pocket is plenty wide, and I don’t have small hands. Because of the minky and micro-chamois, this diaper is soft and silky on both sides. I know I keep using the same words to describe it, but I honestly can’t think of anything more fitting. I was also very pleased with the snug fit around my son’s legs. My favorite thing about this diaper is the custom embroidery, of course! In these photos, my son is 5 1/2 months old, 19 lbs., and 24″ long. The diaper is snapped at the smallest waist setting, without crossing the tabs. I also have the diaper snapped at the smallest rise setting. The waist is still fairly loose snapped like this, so there’s plenty of room for growth in the width and rise of this diaper. 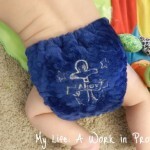 The embroidered pocket diapers by Roxie Harlow retail for $21. This makes them on the higher end of the price range for pocket diapers. Considering the lush fabrics used and the unique, custom embroidery, I don’t think this is a bad price at all for these diapers. Besides the embroidered pocket diapers, Roxie Harlow also sells hats, beanies, hair clips, fleece shorties/longies, diaper inserts, onesies, dolls, and regular pocket diapers (no embroidery), loveys, and more. You could win this diaper! Can’t wait? 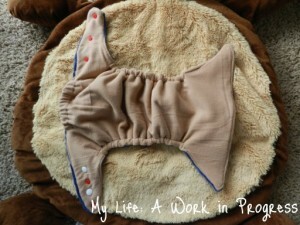 Visit Roxie Harlow on Etsy to purchase a ready-made diaper or order a custom diaper. 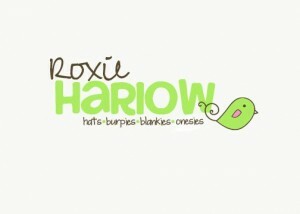 Follow and “like” Roxie Harlow on Facebook to keep up with the latest news. What a rocking review!!! I would love to try out of of her diapers!!!! I love the embrodary aspect – so CUTE! i especially love the smelly skunk embroidery that can be found on etsy it was supper cute and funny! That does look really soft. I’m sure that is extraordinarily comfort for any child wearing them. I like how you can customize the diaper! love <3 the minky very cute looks really soft! Love love love customs annnd minky!!!! Awesome review! Love the embroidery and the super soft look of these diapers!!! Def digging the chamois cloth layer! My gosh does that look soft!!! 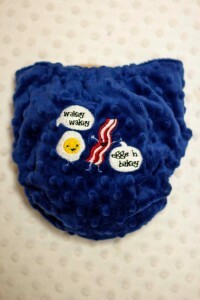 I think my baby’s bum would like this diaper very much! LOL Eggs and bacon, thats hilarious! You have no idea how freaking long I tried to find you! I saw The Lorax diaper online and was gonna go back… and I could never find it again!!! Yay! I am so freaking excited right now! I love minky fabric. 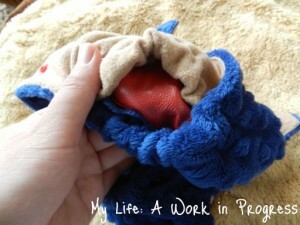 I only have one minky diaper right now, and it is my son’s favorite. I love the embroidery! Such a cute diaper! I love minky diapers! They are so soft. I really like the hidden layer of PUL and that it is waterproof! 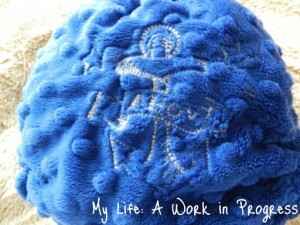 The minky looks so soft, and I like too that the inner is not pure white so it doesn’t show stains as bad. 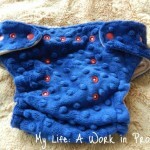 I love the hidden layer of PUL! Brilliant!